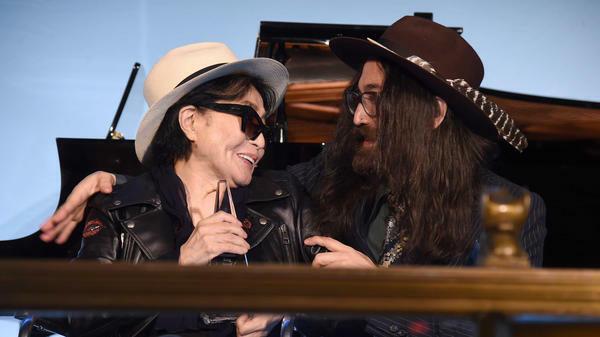 Yoko Ono, accompanied by son Sean Lennon, accepted the Centennial Song award for "Imagine" at a National Music Publishers' Association event Wednesday in New York. "Tonight, it is my distinct honor to correct the record some 48 years later," David Israelite, president and CEO of the National Music Publishers' Association, said Wednesday night in New York at his organization's annual event.
" 'Actually that should be credited as a Lennon-Ono song because a lot of it — the lyric and the concept — came from Yoko. But those days I was a bit more selfish, a bit more macho, and I sort of omitted to mention her contribution. But it was right out of Grapefruit, her book.
" 'There's a whole pile of pieces about "Imagine this" and "Imagine that." ... But if it had been Bowie, I would have put "Lennon-Bowie," you see. If it had been a male, you know. ... Harry Nilsson — "Old Dirt Road," it's "Lennon-Nilsson." But when we did ["Imagine"] I just put "Lennon" because, you know, she's just the wife and you don't put her name on, right?' "
Ono's and Lennon's son Sean, who accompanied his wheelchair-bound mother to the ceremony, wrote afterward in a Facebook post that it was the proudest day of his life, describing tears welling in his mother's eyes before Patti Smith sang the song. Of course, as with most things on the business side of music, it's not as simple as just adding Ono's name to record sleeves. Variety caught up with Israelite after his speech, where he "noted there may be some opposition to the move at some point along the way," in part due to the ripple effect the move would have on distributing payments for "Imagine." Israelite also said the change had not been finalized at the time of the organization's ceremony. Ono's prolific solo output — some, with no trace of irony, featuring a songwriting credit to John Lennon, as the anagrammatic "Joel Nohnn" — records are in the midst of a reissue campaign by the label Secretly Canadian. Last year, the label re-released 1968's Unfinished Music No. 1: Two Virgins, Unfinished Music No. 2: Life with the Lions from 1969, and Plastic Ono Band. On July 14, Fly, the rock opera Approximately Infinite Universe and Feeling The Space from 1973 are slated for re-release. Watch below to see Lennon, in an interview alongside Ono, describing the melody and lyrics of "Imagine" just ahead of its release in 1971.